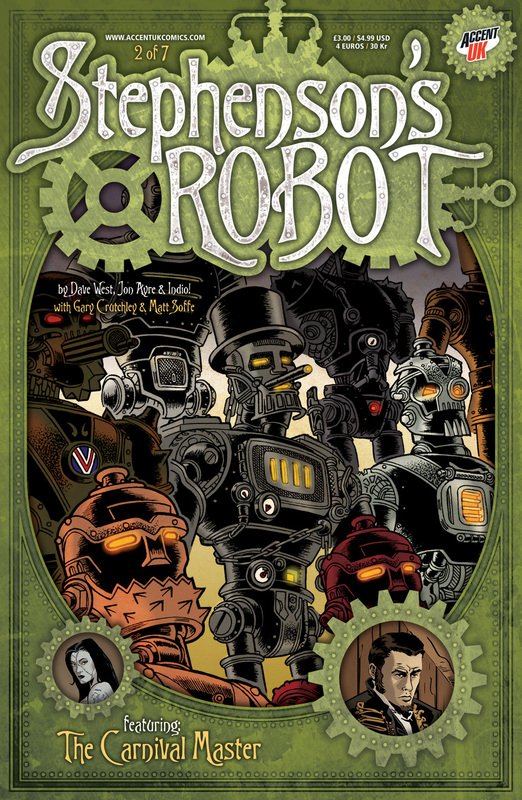 Stephenson's Robot Issue 2 is nearly ready to print. The great news is that we've nearly pulled together issue 2 of Stephenson's Robot. Once again Andy Bloor has pulled the design together follow on from the look he crafted for us with issue 1. 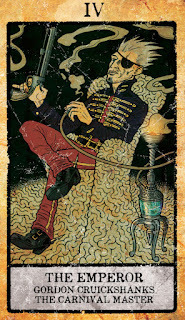 Gary Crutchley has illustrated the Backstory this time around, a tale about the Carnival Master written by one of the co-creator of the series Jon Ayre. Indio! 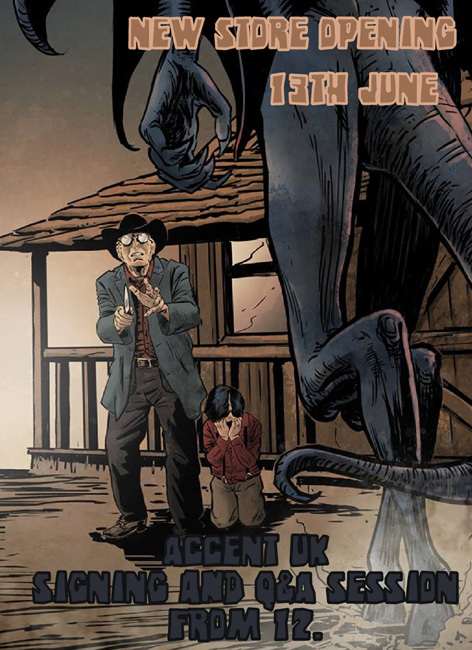 once again illustrates the main story, written by myself, which carries on exactly where issue 1 left off. ...and for those of you interested in collecting the limited edition Tarot cards that accompany each issue, this time around it's The Emperor. 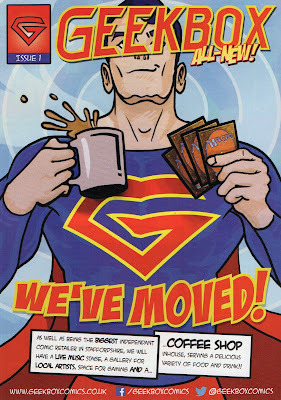 The Launch of the new GEEKBOX store. The GeekBox store has been very supportive of Accent UK books over the past 6 months or so, and so when Dave (the owner) invited us to take part on the launch of his new, larger and better located store, it seemed like a good chance to reciprocate. It sounds crazy and it was. It's a good job that the new store is bigger as you would never have squeezed all the people who turned up on the day into the old premises. We sold some books, talked about comics and had a very nice cup of Earl Grey Tea from the In Store Coffee Shop. A really enjoyable day in a store that has loads of space and someone creative enough running the show to make best use of it all. 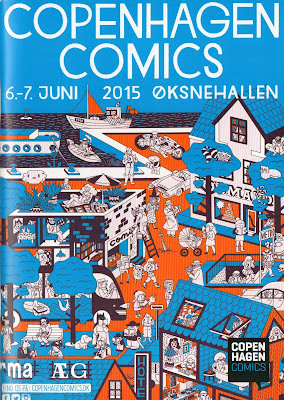 The best Copenhagen Comic Con ever. We've been attending the Comic Conventions in Copenhagen since 2004 and, having missed none of them, this was to be our sixth. We've been seeing sales climbing over the past couple of events and so with four of us traveling over this time around, Gary Crutchley, Scott, Colin and me, we decided to throw caution to the wind and cram as much stock into our luggage as we possibly could. Going through baggage check in on Friday morning was a little stressful, as nearly all of us were slightly over the 23kg, but SAS flights didn't make an issue of it, the lady only asked us if we were moving house, and so a few hours later we found ourselves in Copenhagen, with all of our stock. My suitcase had suffered a little however and the handle had been snapped off during the process of moving it from one airport to another, but I wasn't going to let that spoil my weekend. We also decided to have two tables this time. Partly due to the stock but mainly due to the fact that we were launching a new book by the very talented Martin Flink. We published his Man Of Glass a few years ago and had just published The Troll. We are, of course, past masters at setting up the stall these days, and Colin made good use of the back boards with some posters and signs (in his version of Danish ;o). And so with a nice space left for Martin to sign his books, the tables were ready, and we had time to wander around, meet old friends and see what the other creators had brought to tempt people (ourselves included) to part with their money. It all looked very impressive. Leaving a few suitcases behind, transferring the small amount of clothing we had to hand luggage (now empty of additional comics), we set off to find the hotel. We stopped at The Normal shop that evening on the way to the Event Meal but it was closed. We've been to a few of these event dinners, which the Danes like to use to launch the event, and they've proven to be pretty good, another chance to meet and chat with old friends, and the food is typically pretty good. Two years is a long time and there was a lot of news. Language has never been a problem in Denmark, the Danes speak perfect English. A nice end to a long day. The Normal shop is normally closed we found. Saturday morning, after an interesting breakfast, where we met up with our good friend Garen Ewing, we set off once again for the Con venue. No heavy bags to carry this time though, just a nice walk in what was shaping up to be a very sunny day. No huge queue outside, but we were used to this and we expected the Danes to continue to stroll in throughout the day. We had another look around the venue, chatting to other stall holders and meeting other friends and then the doors opened and we were joined by Martin Flink, keen to get to work signing his The Troll book. It was great to see Cliodhna Lyons at her table directly opposite ours. I first met Cliodhna at the first Mocca event we went to in New York. Cliodhna had a whole range of books, cards and arty bits and bobs on her stall, including a few mermaid cards ... not the kind of mermaid that appears in WesterNoir though, hers were the cute variety. It was a slow start, as these things invariably are, and I must confess that around lunchtime I began to wonder if we'd brought far too much stock. Maybe the experiences of recent Cons in the UK were not going to be repeated in Denmark. And then things picked up. Gary's wonderful sketch packs started to fly off of the table. We had repeat customers coming over to pick up issues 3, 4 and 5 having bought issues 1 and 2 two years ago. And then the first day was over, we'd had a great day and despite being pretty tired, arranged to meet a few friends for a beer and burger (or similar) later. Garen (with a huge drink of Orange Juice), Scott, Colin, Jan and Gary. We had a very enjoyable evening talking comics and catching up over a few beers, but were all up bright and early for breakfast and the short work back to the venue for Day 2. Sunday started slowly but again picked up around 11am and we started to get a steady flow of interested people wanting to find out about our books. A few returning customers and once again someone who picked up issue 1 of WesterNoir, only to return a couple of hours later for the rest of the set. One of Gary's hopes for the weekend was for him to meet Peter Snejberg. Peter has produced some great comic books over the years and Colin, being the friendly sort that he is, had met and chatted with Peter at the last Copenhagen Con. Colin somehow arranged for Peter to pop over to our table. So, there he was sitting for about 30 mins, chatting away with Gary over a beer. 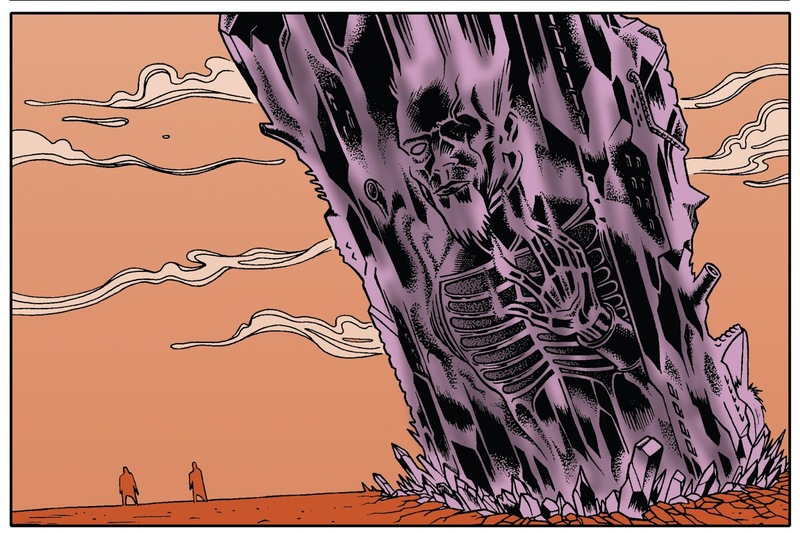 I think that that, as much as the response to WesterNoir, made Gary's convention. By the end of another busy day we'd sold out of a number of titles, typically not be able to sell a few more sets of WesterNoir as we'd sold out of issue 1, 2 and 5. Other titles had also sold very well and we were very happy that the bags we were to carry home would be much lighter than those we'd brought over with us. That evening we'd arranged to meet up with Soren Pedersen (and old friend and founder of the Fantask comic shop) and his wife Vibeke, and so after a nice relaxed walk from the hotel with Garen in tow, we arrived at The London Pub, where we were later joined by Cliodhna. It always makes me smile that we tend to end up in pubs with a British theme, and this one actually did have the right feel. The food was interesting, with us choosing a stew that contained all sorts of stuff. It was kind of a Full English Breakfast (without the egg... I think) in a stew. It was actually very very nice. And so there we were, talking comics, talking about Colin's future Gay Gordon's Ghost comics project (I'm still not sure if he was joking or not) and having a really enjoyable chill out after 2 fun, but busy, days. Monday we said our farewells to Garen over breakfast and spent the rest of the day with Soren, seeing the sights. It was great to be able to spend time with Soren again and is something we look forward to each visit. Which just left Tuesday morning to wander into Copenhagen City Centre, leave our very light (and my very broken) bags at the station, wander around the shops a little to pick up some gifts and then get ourselves to the airport, and home. We had a really wonderful time at this year's Convention and are already looking forward to going back in two years. 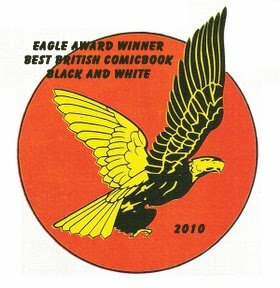 Copenhagen Comic Con and then the opening of the new, larger, GeekBox Comics store in Newcastle Under Lyme. 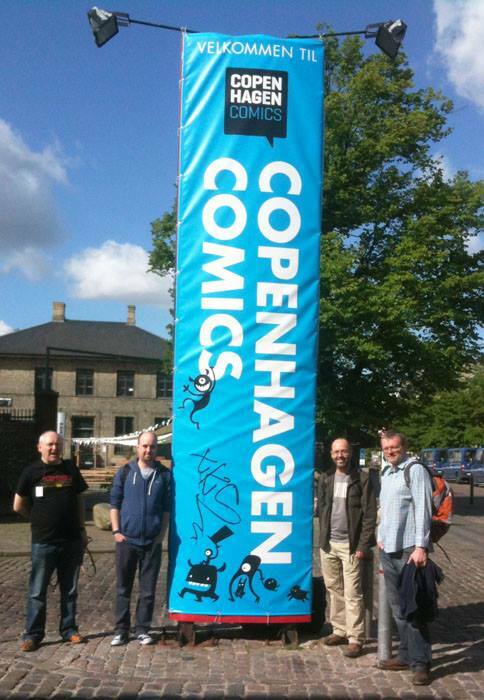 This weekend we (that's me, Colin, his son Scott and Gary) fly out to Copenhagen for their Comic Convention. We've never missed one (in fact I think we were at their first event), and are looking forward to catching up with a lot of friends over there. 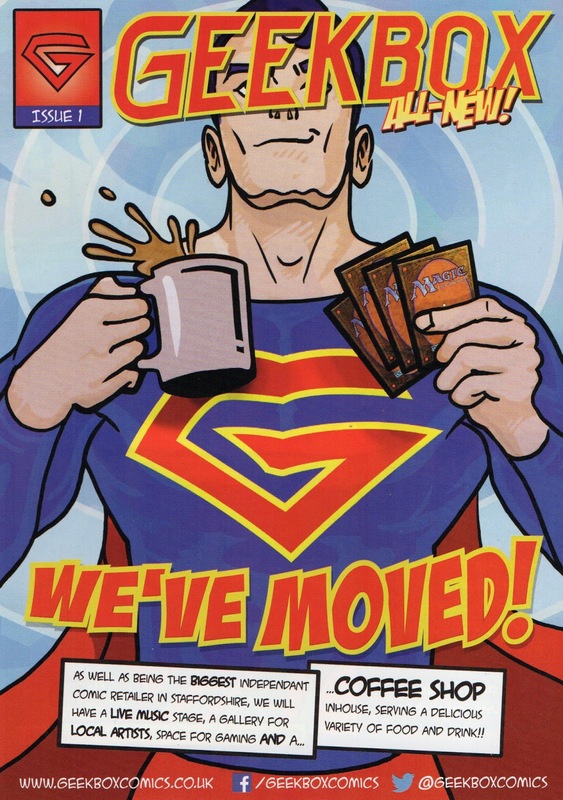 And following that, on Saturday the 13th we'll be present to help celebrate the opening of the new, larger, Geekbox Comics store in Newcastle Under Lyme. It's great to be invited to share in a great day for the store. The poster (above) is already on display in the store windows. So, a busy few weeks ahead of us, almost as busy as the last few behind us with Colin and his other son Adam having such a great day at the Granite City Con in Aberdeen.